The official live stream of Sky News has been pulled from YouTube after a copyright complaint from competing news outlet Fox News. 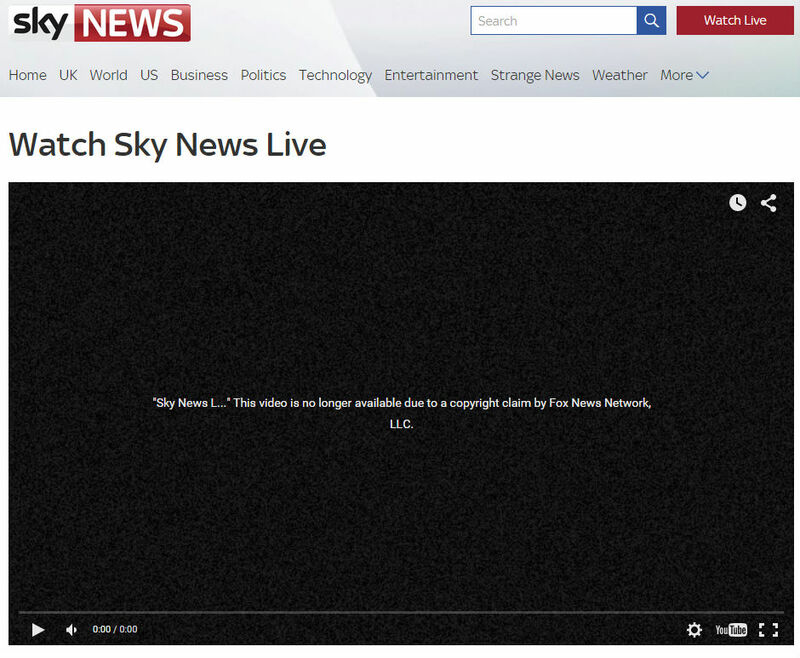 Instead of the latest news, visitors to Sky News' website are greeted with a black screen stating that Sky violated Fox's copyrights. On YouTube most takedown notices are automated through the Content-ID system, a tool which allows rightsholders to upload their work and take down unauthorized copies. Unfortunately this process is far from flawless which results in many false and inaccurate DMCA claims. We’ve highlighted this issue before, but today it’s literally hitting mainstream news. Starting a few hours ago the online live feed of Sky News stopped working. Not because of a technical issue, but due to a copyright complaint from fellow news network Fox News, which is also owned by Rupert Murdoch. As a result, visitors to the Sky News Live stream page, which is hosted by YouTube, are now welcomed by the following message. There is no further information available on the reason for the takedown, but it seems plausible that it’s the result of a Content-ID mismatch. Fox News is adding its broadcasts to YouTube’s system and this most likely included the same footage Sky News showed. This would make sense, as many news organizations rely on the same independently licensed material. At the time of writing the official Sky News Live feed on YouTube is still offline. There is an alternative live feed available through YouTube that still works. Unless there’s a real copyright feud between Sky News and Fox News this latest example shows that YouTube’s Content-ID system is far from optimal. In this case, the error will probably be swiftly corrected, but for independent publishers it can take weeks for their content to be reinstated. TF contacted Sky News and Fox News Network for a comment. At the time of publication we haven’t heard back yet. Update: Fox also took down its own livestream briefly, which supports the theory that it’s the result of a Content-ID mismatch. Update: After at least 8 hours Sky News has now changed the embed on their live stream page. The original video is still down.